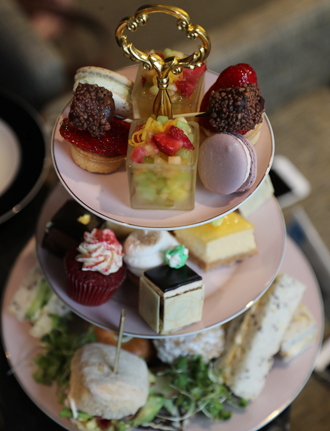 The Lobby Lounge serves a high tea that ticks all the boxes. It cleverly borders on both rustic and refined. The Lobby Lounge serves a High Tea that ticks all the boxes. It cleverly borders on both rustic and refined. I would advise eating very little before you go. The Lobby Lounge is in The Intercontinental Wellington. It is central high end hotel and has recently undergone a major refurbishment. The Lobby Lounge is a nook off the main reception and is a modern, bright and cosy space. The tables used for High Tea are in various nooks centred around the main bar area and the seating is mainly comfortable arm chairs. The Lobby Lounge is a great place to sit, watch the world pass by and enjoy the High Tea that is set before you. On arrival we were seated and the High Tea was explained. We were left to choose out tea. The table was laid with beautiful black and gold side plates, which also matched the very Alice in Wonderland Christina Re teapots. The tea was TWE Tea from Singapore and came in a sealed packet with a large hessian tea bag, we were unsure of protocol and put our bag into the hot water in the teapot we were each given. I chose the lovely light Silver Moon tea and my companion opted for the robust Imperial Lapsan Souchong. Both matched the food nicely. When our tower arrived the food was explained and we were advised to leave the chocolate popping candy lollypops until last. 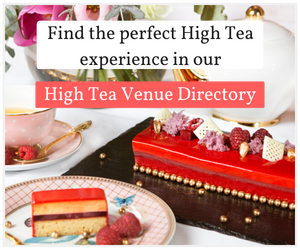 This High Tea menu is large, the three tiers are packed full of delightful goodies which are made by the hotels pastry team. Each layer had items that were the more traditional English such as lemon meringue pie and French style delights such as delicate chocolate mousse with a chocolate sponge base and encased in a chocolate box. This is truely a continental high tea showcasing the pastry teams various skills. Everything tasted wonderful as well as looking fantastic. The food Was it good quality? What was your favourite item? The bottom tier came packed with savoury items and a just warm perfect date scone. Traditional finger sandwiches, smoked salmon bagel, house made bacon and advocate slider and pumpernickel bread all impressed, although the bagel could have had a bit more of crunch on the outside. As mentioned above, the scone was perfect and had that outer crunch and soft fluffy inside with small pieces of soft date throughout. Saving the scone for last on this tier was a nice move for the mouth towards the sweet tiers. The sweet tiers lead to the conundrum, where do we start? Everything looked perfect and the variety was amazing. This layer alone had five portions and we started with the Gateau Opera which was adorned with a royal icing flower. It was delicious and the lightest most balanced Opera Cake I have eaten, the chocolate squares encasing it added a good balance to the coffee flavour. A Lemon Cheesecake, Red Velvet Cupcake, Lemon Meringue Pie and an Organic Chocolate Mousse also featured and were delicious. I particularly liked the Mousse with a good dark chocolate taste. The pastry on the lemon meringue disappointed me a little as it was on the softer side. The pastry redeemed itself with the Strawberry Tartlet on the top layer. This was a good case and nice and short, it had a good crunch and was delicious. The fruit salad was a nice palate cleanser and the fruit was cut into tiny morsels, I enjoyed the lightness of it. Our top tier had two macaroons, one blueberry and one caramel. I chose the caramel and the taste was amazing, I enjoyed the cinnamon flavour that went well with the caramel. I finished all of my offerings but my companion slowed down towards the end of the second tier. She was able to take the pieces remaining home in a box provided. This High Tea stood out for its generous size and the variation of skills that would have to be used by the hotels pastry chefs. 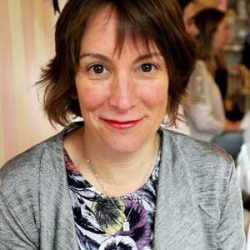 The team is led by Marie Currie and she should be proud of herself and her colleagues. The Lobby Lounge at The Intercontinental Wellington is a relaxing place to enjoy a High Tea. We were there for two hours. The atmosphere was relaxed and I am sure they could accommodate group booking. There is no gluten free option for this High Tea. 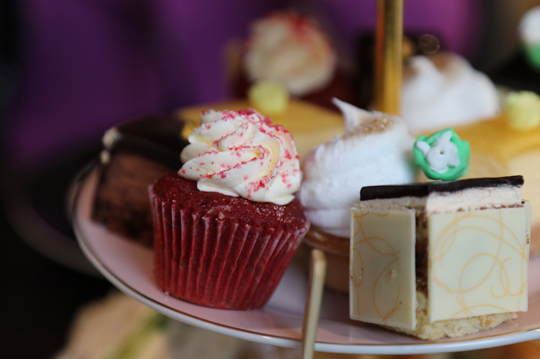 All High Tea menu options include Barista-made coffee, hot chocolate or an assortment of TWG Tea. High Tea with a selection of TWG teas $39. 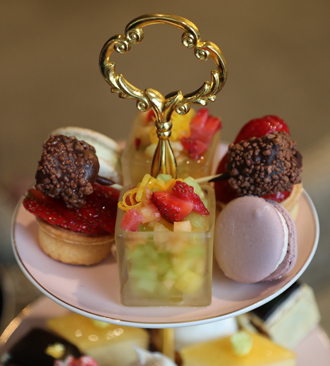 High Tea with Bubbles $45. 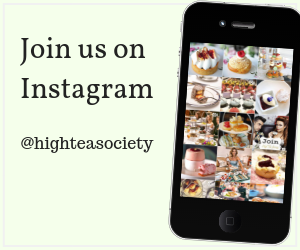 Champagne High Tea $57. Children under 12, $19. Complimentary for children under 4.